FL-HB-12 on 8/2/2014: "Hit twice w/ convective activity: the first round was during the late afternoon from normal sea breeze interaction. The second was much later from outflow boundary interaction. Love it. Not much terms of rain but quite a show." 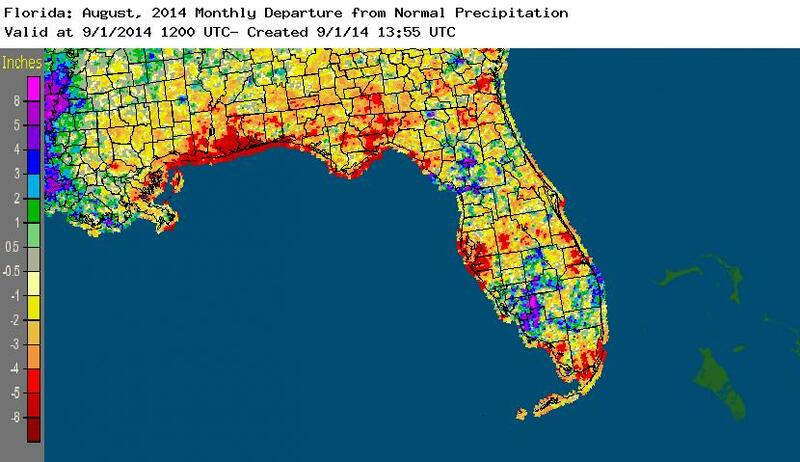 FL-MR-12 on 8/7/2014: "If you look on a map of Florida, then Ocala, you will see the Ocala Nation Forest. I live in SW Ocala Along the Interstate where we get very little rain when the storms come through. Thus I call the area The Ocala National Desert." FL-DV-47 on 8/16/2014: "I didn't notice when this shower came through. Mostly dry throughout the day except for some thunder in the distance. Usual hot and humid weather continues. However, the tropics remain quiet, I'm happy to note." FL-CY-34 on 8/23/2014: "This was a very intense storm with initial winds from the south at about 25-30 mph. The winds shifted to the E-SE and increased to 50-60 mph for about five minutes. The storm(s) past through our neighborhood at about 5:00PM. This was clearly the most intense storm in several years." 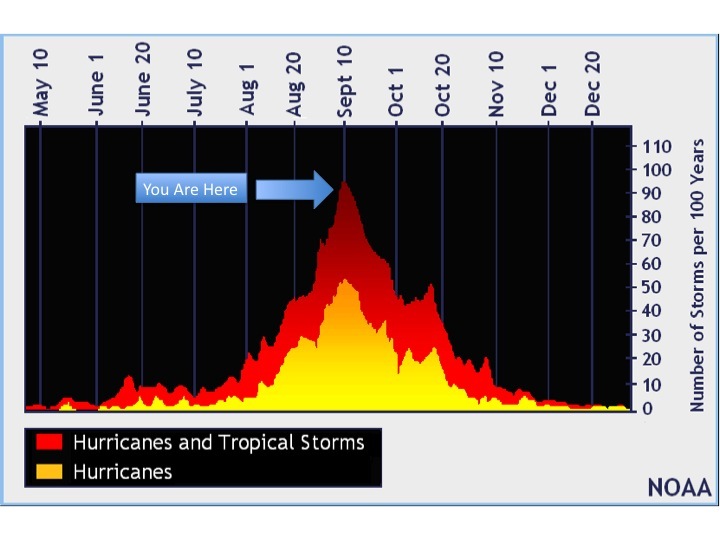 The graphic above shows we are pretty close to the peak of the 2014 Hurricane Season. So far, we had Arthur brush the North Carolina coast in early July, Bertha impacted various locations in the Caribbean Sea before turning and staying well off the U.S. East Coast, and Cristobal clipping the Bahamas. Each one of these storms reached hurricane status during their life spans. Bob (one of our observers since 2010) shared this picture of an interesting cloud formation that formed to the SW of his home in Marion County. 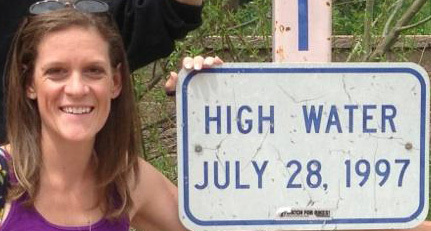 Since I'm also a CoCoRaHS observer, I thought I would share two of my own pictures this month. 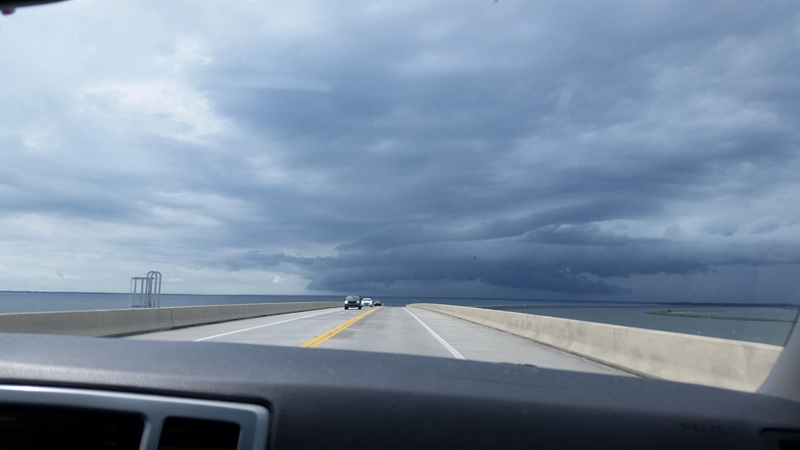 This picture was taken on August 3rd, coming back over the bridge from Saint George Island. This storm produced hail and storm damage in Hosford, FL. 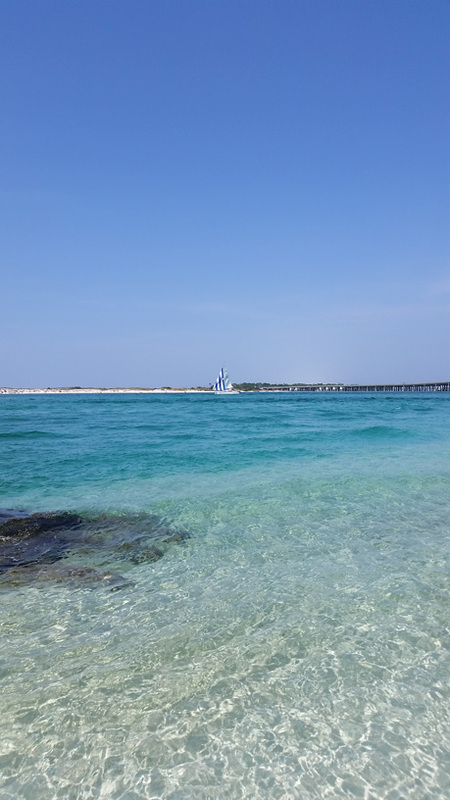 The picture below was taken out at the East Pass in Destin, FL on the morning of the 24th. 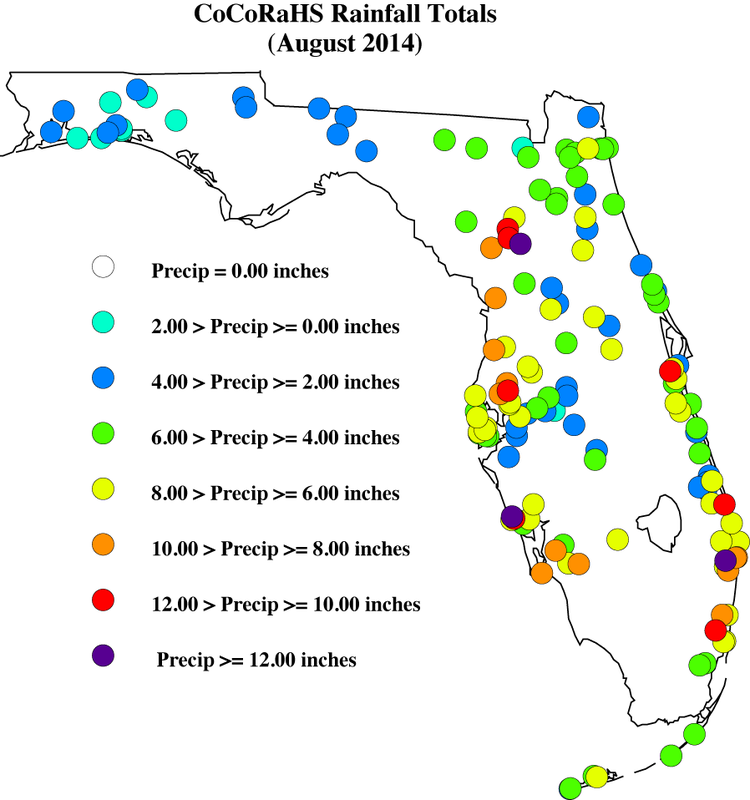 Interior portions of the southern Florida Peninsula reported monthly rainfall totals well above normal, while most of the rest of Florida saw below average rainfall during July (Figure 1). Departures from normal roughly ranged from -5.39" to 0.19" (Table 1), though localized parts of Florida saw rainfall totals that were as much as 8.00" below normal to over 8.00" above normal. August 2014 was the 2nd driest in Tallahassee (the driest was in 2011, with only 2.03" reported for the month), 2nd driest in Daytona Beach (the driest was in 1963, with only 2.01" reported for the month) and it was 4th driest on record in Pensacola. There were multiple 24-hour precipitation records broken for the month (Table 2). The summer (June-July) was the driest on record in Tallahassee (only 8.99", which is -13.26" below normal) and the 2nd wettest on record in Miami (38.98", which is 13.93" above normal). Table 1. August precipitation totals and departures from normal (inches) for selected cities. Figure 1. A graphical depiction of the monthly rainfall departure from normal (inches) for August is given in the figure below (courtesy of NOAA, NWS). 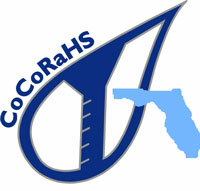 Here are the CoCoRaHS rainfall totals for August from some select CoCoRaHS stations across the state. The state started the month of August with abnormally dry conditions (D0) shown for most of the Big Bend and Panhandle counties after 3-months of below normal precipitation had been observed. Tallahassee reported its driest summer on record (back to 1893) with more than 12.00" below normal rainfall for the June, July and August, and Jacksonville reported its 7th driest summer on record (more than 8.00" below normal). 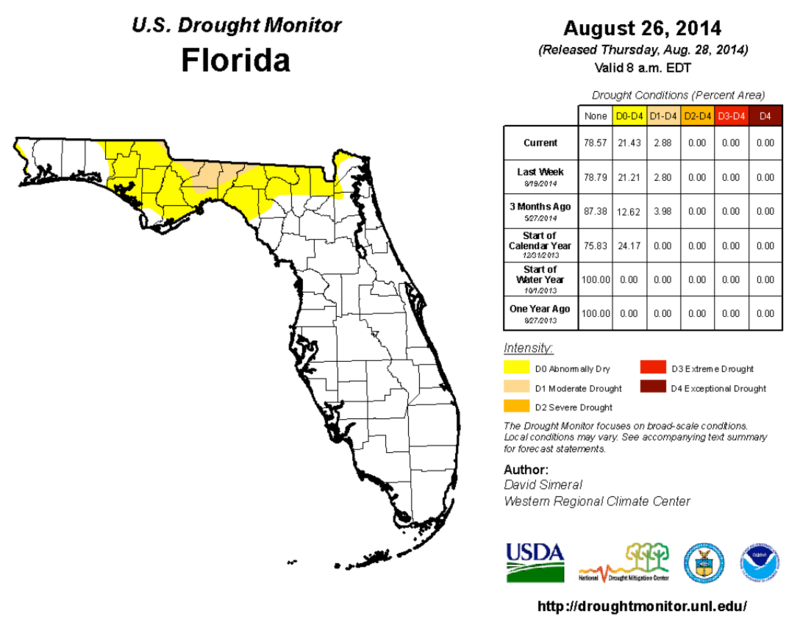 The lack of rainfall in the northern part of the state lead to deteriorating conditions in portions of Gadsden, Jefferson, Leon and Wakulla counties were moderate (D1) drought conditions were introduced. The area of D0 in Panhandle and Big Bend expanded east, to portions of the Suwannee River watershed. In the Peninsula, the summer rains, while less than normal, inhibited any southward expansion of dryness during the month and Miami area reported its second wettest summer on record (over 14.00" above normal). The water levels in Lake Okeechobee were currently at 14.53 ft., which is up from the end of June, but below the lake level at this time last year (2013).